Junior wanted to know about Radiograms. Grandad explained that they were a very popular way of having two things in one. "Why do you need to do that?" asked Junior. "It helps to avoid so many separate bits and pieces," replied Grandad. "With the electric turntables and pickups, the sort I showed you before, it was normal to feed the signal into the 'pickup' input of the wireless. This meant that there were two boxes, the gramophone and the wireless." "Yes, I see," said Junior, "But you mean the record player and radio, Grandad." "Do I? Hum, I suppose I do," said Grandad, not really concentrating. "Using individual parts meant that there were two things that quite probably didn't look alike, which upset houseproud people like Grandma. She prefers to have one cabinet that contains both items, even if they are not so good as if you could choose the best of each. "Once the radiogram was a whopping great big thing, that took up lots of space, but as time went by and more people could afford to buy them, smaller and more elegant radiograms were available." "Grandad, did you have a radiogram? ", asked Junior. "We still have one," replied Grandad. "It's a Civic GR-4410 'Sonata'. Would you like to see it?" 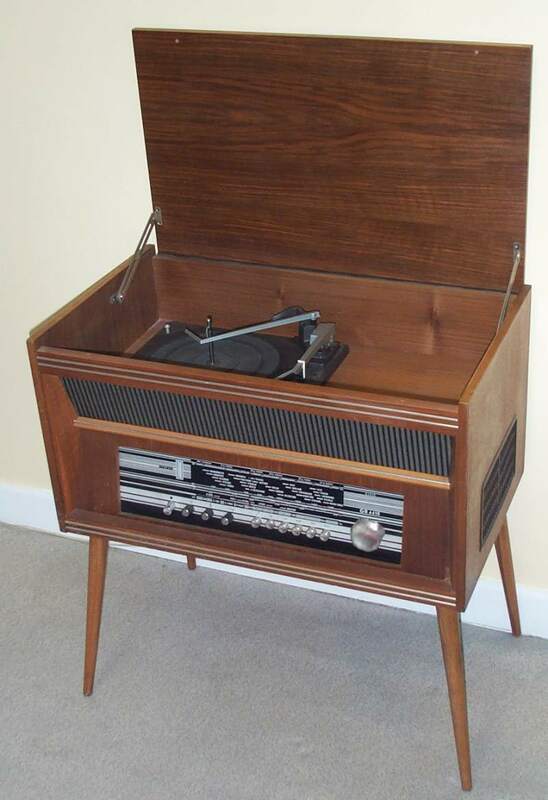 Grandad went to the other side of the living room and showed Junior the radiogram. It was like a box on legs, but it clearly had a radio at the front. There was no record player to be seen. "I've seen this before," said Junior, "But where is the record player part of it?" Grandad lifted the lid and showed Junior the record deck. "This is called an autochanger," said Grandad. 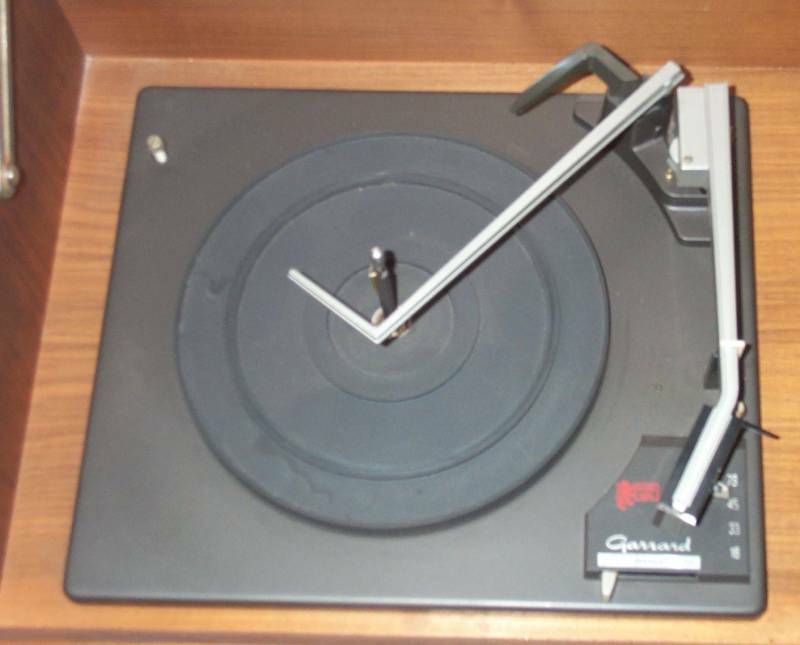 "This one is a Garrard Model 1025 Automatic Turntable. It can hold several records, and as one finishes playing, it moves the pickup away and drops the next record from a pile at the top down onto the one that just played. Then it plays the one that it dropped. It should only drop one at a time, but sometimes two come down together." "Gosh, that's clever!" said Junior. "But what if the record is breakable, like those old 78s that you showed me?" "Well, 78s were not so common by the time that this deck was made. Most records were made of plastic by then, so they were lighter and also didn't break. Even so, it was normally O.K. to use the older shellac 78s; as they fell they made a sort of air cushion that stopped them shattering. Usually. "This one is even cleverer than it seems. That little lever on the outside senses whether the record is a big one or one of those little 45s. Then it knows where the start of the record is when it begins to play it." Junior was thinking. "It's a pity they didn't start playing from the middle," he said, "Then it wouldn't matter what size the record was." "Once, a long time ago, some were made like that, but it didn't catch on," said Grandad. "But these days, things like CDs and DVDs do start in the middle, for just that reason." "There was another advantage with radiograms," said Grandad. "Because both parts were in one cabinet, there was only one mains lead to worry about, and no wires to interconnect. It was all much easier, as well, because the maker had already sorted out all the signals and made sure that all the parts worked together." "Where did your radiogram come from?" asked Junior. "A friend gave it to us," replied Grandad. He bought it new in 1970, when he was 20, and later it was used by his Mother. When he knew that I wanted one, he kindly gave it to me. Grandma really likes it - she says it's much tidier than the stuff we had before." "Does it work better than the Radio and separate Record Player?" asked Junior. "Hmmm, well, this one does have more wavebands, including the new-fangled VHF radio," replied Grandad. 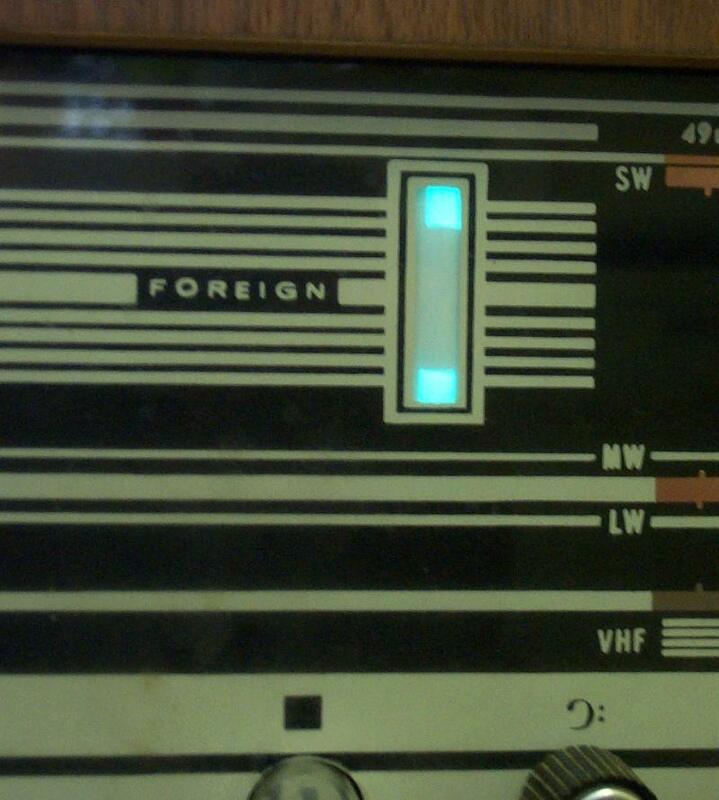 "What is VHF radio?" asked Junior. "It means 'Very High Frequency'," replied Grandad. "Much higher than the Medium or Short wavebands that we had before. They used a different modulation called F.M. which stands for 'Frequency Modulation' in place of the A.M. or Amplitude Modulation that was used before. 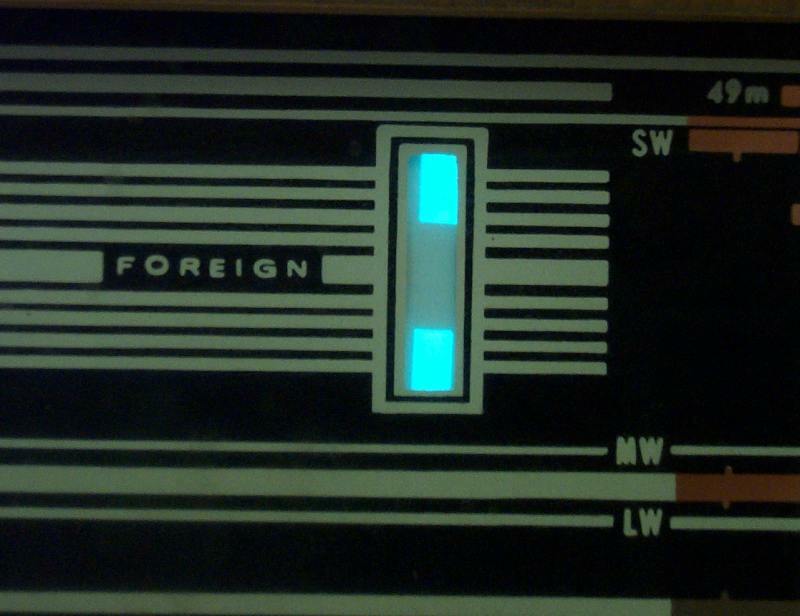 As well as that, a new-fangled way of putting two sound channels onto one station was used. They called it 'Stereo'. 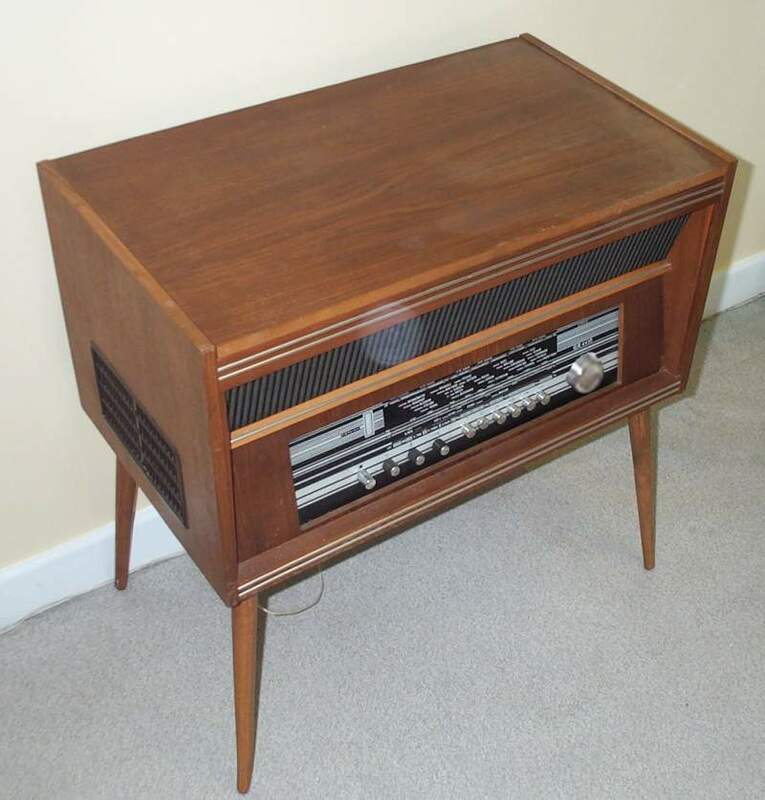 This radiogram is only Mono, though." "What is 'stereo'?" asked Junior. Grandad said he would explain it another time. "Ooh, Grandad, is that a Magic Eye like the one you showed me before?" he asked. "This one is a modern version of that old original eye," said Grandad. "It is a much smaller valve, as most of them are now, and it works in a similar way but looks quite different, really. "Instead of a rosette of glows, this one has just two 'bars' that sit, one at each end of the scale when there is only a weak signal being received. "As you tune in a stronger signal, or simply adjust the tuning knob better in order to make the signal stronger, the bars become longer, moving towards one another. Eventually they can meet in the middle and I have seen them overlap even!" They played with the tuning of the set and watched the bars grow and shrink. "I understand why a magic eye was useful on that bridge, but why is a magic eye useful on a radio?" asked Junior. "With the bridge, it helped us to set the balance adjustment to give the best null, by adjusting the knob for the smallest glow," answered Grandad, "But with a wireless - I mean Radio (he said it scathingly) it has a different use. This time, especially on the FM (Frequency Modulated) band, we need to be sure that the tuning adjustment is set for the strongest signal. If it isn't, we get quite bad distortion on FM that can sound rather horrible. To help people tune what is called the 'centre frequency', which is where the signal is strongest and the distortion lowest, the magic eye shows the strength by the length of the bar. Longest bar equals strongest signal." "Longest is Strongest," rhymed Junior. "So this works opposite to the bridge then, Grandad. With the bridge you said we wanted the best null, so we set the knob for the smallest glow. With the radiogram we want the strongest signal, so we set the knob for the biggest glow." "That's right," said Grandad, smiling. "The same thing only different." "Grandad, next to the Magic Eye it says 'FOREIGN' on the glass. Why does it say that?" asked Junior. "In those days it was quite common for goods that were not made in the UK to say that somewhere, even if only in the manual where it might say 'Foreign Made'. People were still supporting British-made goods then, but what is more, there still were British-made goods! Now it seems as if everything we buy is made in another country; it doesn't say where very often." "Where was this radiogram made?" asked Junior. 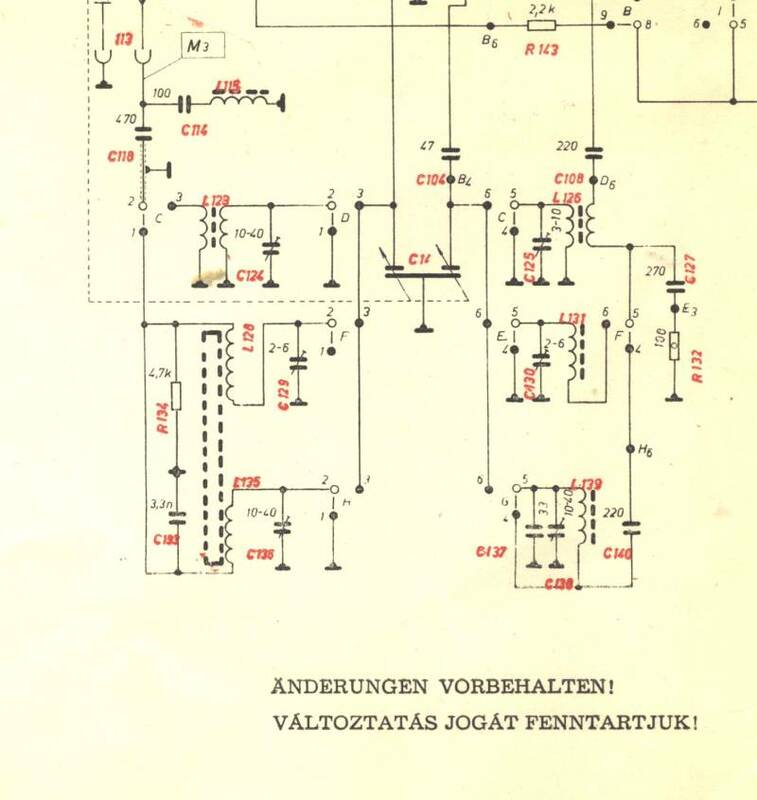 "If we look at the circuit diagram, we can see that it uses German words, and all the electronic symbols are in the German style of that era, so I am pretty sure that this set was made by Grundig in Germany but sold over here as a cheaper, 'unbranded' item . That would explain why it has a model number 'GR4410', the 'GR' probably stands for 'Grundig'." "Does that mean it isn't very good?" asked Junior. "Not at all," replied Grandad. "Grundig made very high-quality things. If it had their name on it, it would have cost a great deal more." 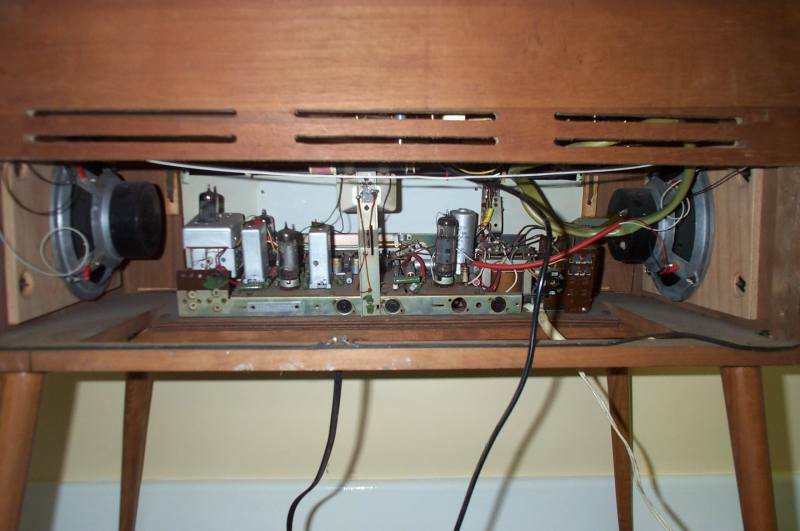 As they so often did, Junior and Grandpa unplugged the mains and opened the back of the radiogram to look inside. "Grandad, I thought you said this was only mono," said Junior, "But it has a loudspeaker on each end. I thought that would make it stereo?" "Not this time," replied Grandad. This was only mono, but it had two loudspeakers both wired together and doing the same thing. Maybe there was another, more expensive model that worked in stereo and used the same cabinet. You can see some of the valves though; those awful little modern 'B9A' all-glass valves." Junior thought the valves were rather nice-looking compared with the great big old ones that he had seen, but he wisely kept his thoughts to himself. "I like this radiogram," said Junior. "Yes, so does Grandma," said Grandad. They all listened to Grandma's favourite record, a present to her in 1980, ages ago - 'There's No One Quite Like Grandma' sung by girls of St. Winifred's School Choir. Grandad said "It was number one in the hit parade. We don't play it too loud, but Grandma likes it." Junior wondered what he meant.